Jon had a great birthday yesterday. He loved his gifts and my very first double layer cake I made for him! But more on all of that tomorrow. 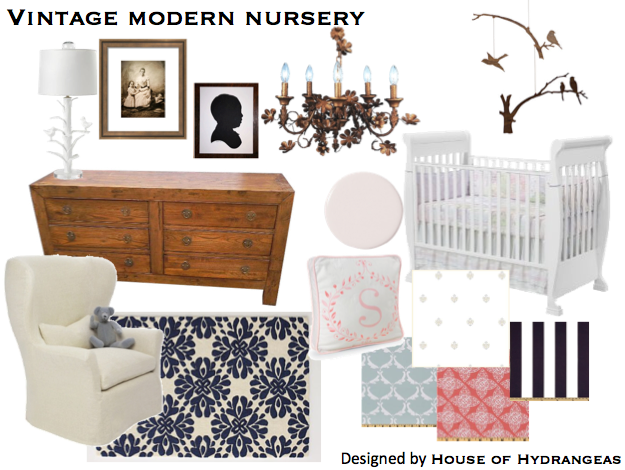 Today I want to show you a vintage modern nursery design board I've been working on. My favorite rooms always have contrasting elements in them. Sometimes too much of something can be a bad thing. You have to mix it up! Whether it be materials or periods of style, I think the most beautiful rooms have an effortless juxtaposition to them. 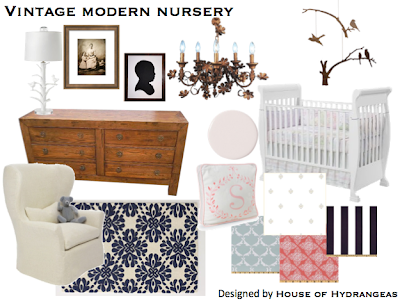 In this nursery I achieved that in several ways--through the use of varying materials, colors, patterns and furniture pieces. One of my favorite things about this design is the use of pink AND navy fabrics. Who said navy couldn't be used in a little girl's nursery? The two colors balance each other out and add a sophistication to the room without making it over the top girly. I love it all came together and how each piece plays off of the other so nicely. Hope you like it too! I'd love to hear what you think!